We also provide ACP Structural Glazing to our clients. We have a large collection of designs and colors that have high insulation capacity which are easy to maintain. 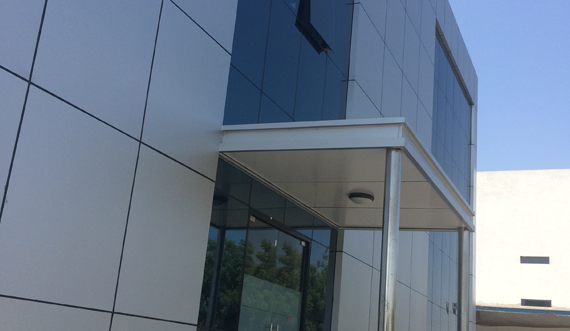 Our Structural Glazing Work has the capacity to withstand wind pressure, corresponding beam displacement and also provide safety from air and water infiltration. These are highly appreciated by our clients. From a weathering perspective, Structural Glazing systems are typically reliant on the application of sealant. Therefore once a Structural Glazing system has been installed and initially tested under severe weather conditions (assuming the seals not subsequently damaged / punctured), integrity of weather should be maintained for at least 10 years from application (the warranty associated with this product). Structural glazing systems are installed at as low as 3-5 degrees pitch and it do not rely on internal weep systems and subsequent drainage. In fact external walk on glass specifications are often installed as low as 1 degree pitch.